Carl Oscar Borg, protégé of Phoebe Hearst, friend of personalities like Edward Borein, Thomas Moran and Charles M. Russell, could create any subject in any medium, and do it well. He was most successful and highly regarded during his lifetime, receiving numerous awards and medals. In the annals of American art history, Carl Oscar Borg belongs to the group of artists including Joseph Sharp, E. Martin Hennings, Walter Ufer, Victor Higgins, and Oscar Berninghaus. Borg belongs also to the group of American artists who came to California at the turn of the century to record the California landscape—artists like Marion and Elmer Wachtel, Hanson Puthuff, and William Wendt who taught him painting techniques. Borg’s works are included in many major museum, university, and private collection throughout the United States. Borg succeeded in preserving America’s cultural heritage by documenting the customs and religious ceremonies of the Native Americans that had been shared with him. He felt a kinship with the West and the people who introduced him to it. He used paint, canvas and brushes to express the unique qualities he found in New Mexico, Arizona and California. He captured the grandeur of this unusual scenery, which is emphasized by atmosphere, light, color and expanse. Carl Oscar Borg was born into a poor family in Dals-Grinstad, Sweden on March 3, 1879. As soon as he could hold a pencil he started copying pictures from books. He had neither the vocabulary nor the concepts to articulate a philosophy, but he yearned to be a great artist. Borg apprenticed to a house painter at age 15, then moved to London and became assistant to portrait and marine painter George Johansen. He began painting during that time. In 1901, he sailed for the U.S. and worked as a house and furniture painter in the East. It was not the life he had dreamt about, and at the urging of his friends he headed for California. Carl Oscar Borg discovered Santa Barbara in 1903 as he made his way from San Francisco to Los Angeles. California provided the opportunity, support, and the spiritual environments, which permitted his talents to unfold, and his genius to develop. 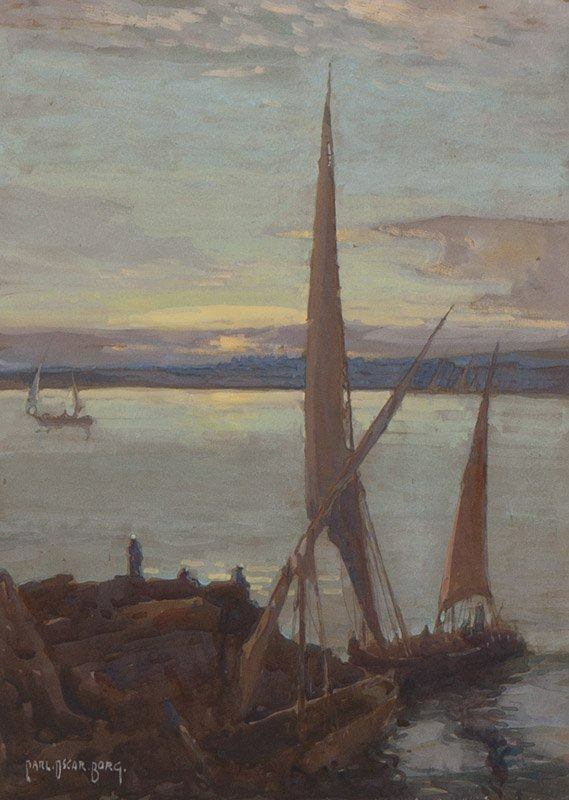 He enjoyed sailing out to the Channel Islands and often camped out weeks at the time to paint. Under the patronage of Phoebe Hearst, who recognized Borg’s talent, he was able to return to Europe to study art. It was also Mrs. Hearst who made arrangements with the Department of the Interior for Borg to live with the Native Americans. Borg wrote: “The inhabitants of these great solitudes, these limitless horizons, this wilderness of color and form, are marked by an Arcadian simplicity, by a dignity and reserve that I am sure would be hard to find among any other living peoples…” And every summer, while residing in California, Borg would return to the desert to spend time with his many intimate friends among the Indians. He taught art at the California Art Institute in Los Angeles, and at the Santa Barbara School of the Arts. He was the first art director for major Hollywood studios and worked with Sam Goldwyn, Douglas Fairbanks and Cecil B. DeMille. For twenty years Borg made his way as an artist in the West, but the West began to resemble the rest of America. Carl Oscar Borg did not like the changes. But the automobile, railroad and the movies did support him as an artist. The Santa Fe Railroad hung his paintings along with other prominent artist’s work in their offices to attract the interest and attention of the tourists. Touring Topics, the AAA’s publication, featured one of Borg’s Grand Canyon paintings on the cover. Borg had a special place in his heart for the Grand Canyon. He wished to have his ashes be given to the wind of the Canyon. But times were changing. Many of his friends in California had died. Borg saw the growing popularity of modern art. It was clear that these artists were fighting a losing battle. Borg returned to Sweden in 1934 and again in 1938. He painted people and scenes of Sweden, and successfully exhibited his paintings of the American Southwest. Although he was an American citizen, he could not return to the United States until after the war. Borg was very homesick for California, and could not wait to get back. He wrote to his friend Edwin Gledhill that he could not spend another winter in Sweden. He returned to Santa Barbara in September of 1945. Many of his friends had died, and he was estranged from the world that had evolved there. But he was at peace with himself. On May 8, 1947, Borg was painting in his studio, as he did every day. That evening, he walked to his favorite restaurant to enjoy his favorite food. He was stricken with a massive heart attack and died in the ambulance on the way to the hospital. As he requested, his ashes were given to the wind of the Grand Canyon.